Sign up to Dry July Australia 2018 and raise funds for Gold Coast Hospital Foundation. Support us and help fundraise to keep our patient transportation service on the road. Gold Coast Hospital Foundation is a community charity that promotes health and helps improve public health care across the Gold Coast Region. Throughout the cancer journey, patients experience a variety of challenges. From the mental and emotional turmoil of being diagnosed with a life threatening disease, to being physically affected by the various methods of treatment. The reality of cancer treatment is harsh, with many physical side effects impacting the patient’s ability to function as they usually would. The task of getting to and from the hospital, before and after radiation or chemotherapy treatment, can be daunting and extremely challenging for many patients. The Cancer Bus Service provides these patients with a reliable transport service that sees them returned home safely after their treatment. This years campaign funds and a grant from the Dry July Foundation will enable patients to continue to attend their appointments with one less worry. You can view a video about the service here. When doctors diagnosed Lisa Gilmer with terminal brain cancer she was given only three months to live. Three years later the 49-year-old remains a survivor of the lethal disease. “The only reason I was diagnosed was because my mother came home and found me collapsed on the floor,” said Ms Gilmer from the Gold Coast suburb of Highland Park. Ms Gilmer spent three days in the ICU at the Gold Coast University Hospital. First came the biopsy to enable doctors to make an accurate diagnosis and then came six weeks of radiation followed by chemotherapy tablets. “They gave me three months … but I’ve always been a bit stubborn. I’m still here. It’s the hardest thing I’ve ever been through,” she said. Ms Gilmer has been using the Gold Coast Hospital Foundation’s Cancer Patient Transport Service to get to and from treatments for the past three years. The service, which operates from 6am to 6pm five days per week, makes close to 10,000 trips annually for about 1000 patients and Ms Gilmer said it was invaluable for cancer sufferers. “You have to think of former Mayor Ron Clarke (who established the service in 2009 in memory of his late daughter Monique who passed away from cancer). All these patients couldn’t survive without the bus service,” she said. She said despite the huge challenge of her incredible fight against the disease, and at times feeling like giving up, the staff at the transport service and the hospital always had a way of making her feel more positive. “People don’t understand what you are going through. They can sympathise but you can’t describe it to anyone. You feel like you’re in your own world … that you’ve gone into another world. You just have to fight it but it never really seems to end,” she said. Despite her mammoth battle, Ms Gilmer has tried to fill her time with positive activities, one being to write children’s book, The Stripy Dachshund, which was recently launched at the Gold Coast Hospital Foundation’s Care for Cancer lunch in March. All funds raised from sales of the book will go to the foundation to help keep the bus service up and running. “The Foundation has been my absolute lifeline. I couldn’t have done it without them. I couldn’t have done it without the Gold Coast Hospital Foundation because their bus service is awesome. The staff is awesome. You can’t get to the hospital without them. You can’t rely on other people. You need them to get you there,” she said. You can help relieve medical hardship for local patients by supporting our Dry July campaign. Thank you to our DRY JULY fund-raisers. 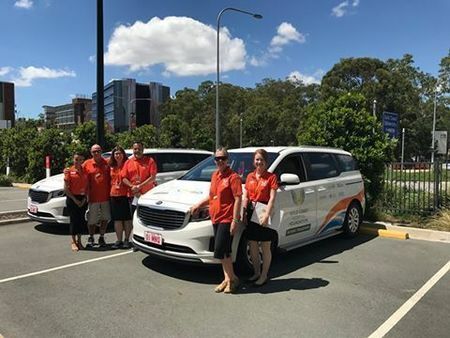 On behalf of all the people in our community fighting to survive cancer, Gold Coast Hospital Foundation would like to thank every one of you and all your family and friends for generously supporting our vital Cancer Patient Transport Service during the 31 day of your Dry July journey. Thanks to your unwavering support, the Foundation will be able to run another 300 journeys with the Cancer Patient Transport Service to help people in our community get to and from hospital for cancer treatment – giving them the greatest chance of having the best medical outcome. We wouldn’t be able to do this without your kind help. Please feel proud of what you have accomplished during Dry July, because you have made a significant difference to so many people affected by cancer. Thank you! The Gold Coast Hospital Foundation have put Dry July funds towards their cancer patient transport service. This service helps hundreds of patients get to and from their home to hospital for cancer treatment. Making more than 10,000 trips every year, this service is vital for cancer patients who live alone, have no family or friends to assist them, or cannot travel by themselves as their exhausting cancer treatment takes its physical and emotional toll. Gold Coast Hospital Foundation is using funds raised through Dry July 2016 to support the Cancer Patient Transport Service at Gold Coast Hospital. The service provides stress free, comfortable transport to patients who are too sick to drive or take public transport, have no family or friends available to help, and/or cannot travel alone.